Clarksville, TN – For volunteer fire departments, the risks that come with the job can often be different than those of full-time firefighting units in major cities. In many small, rural communities, volunteer firefighters battle the same blazes as their full-time counterparts, often meet at the scene rather than all coming together from a central fire station. Because of the independent nature of volunteer units, it can be difficult for unit commanders to identify who is available to fight the blaze when they arrive on site. The GIS Center at Austin Peay State University is constantly exploring ways to use technology to solve every day problems. 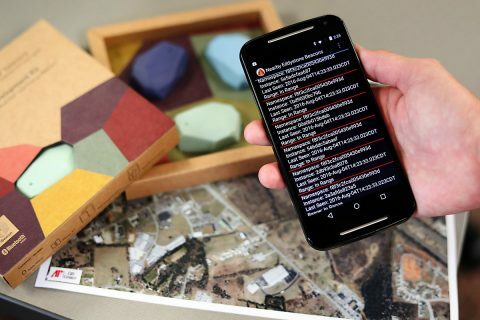 The GIS Center recently received a Google Internet of Things (IoT) Research Award to pursue work toward helping fire departments keep track of their firefighters at active fires. Bluetooth beacons are sort of a 21st century version of a radio beacon or even a lighthouse. By constantly emitting a signal, that signal is picked up by a device designed to detect its presence – in many cases, a smartphone – which individuals or businesses can use to determine location, track customers or even trigger location-based actions on the device. Working alongside APSU students Mason Cordell, Catherine James, Daniel Rumfeld, Jordan Taylor and Sam Gray, Wilson and his team began exploring uses for beacon technology that went beyond advertising. With the goal of helping volunteer firefighters in mind, the team settled on using the cost-effective technology to identify first responders are active fires. Bluetooth beacons typically cost under $10.00 and can last up to two years before being replaced, meaning the technology is not out of the reach of even the smallest of departments. To utilize the beacons, APSU students have developed technology that can run on laptops currently installed in fire trucks, as well as apps for Android smartphones, that allow unit commanders to quickly access up-to-the-moment information on available responders. For more information on this or any other projects, contact the APSU GIS Center at 931.221.7500 or wilsonw@apsu.edu.